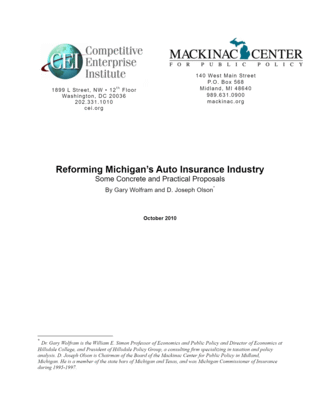 Michigan's insurance industry provides a good example of the unintended consequences of government intervention in the market, and of Mises's interventionist dynamic, in which government intervention begets more intervention. In an attempt to keep any particular person from suffering economic losses due to an auto accident, the legislature enacted the requirement of unlimited personal injury protection. This created a situation where insurance companies face great uncertainty as to their possible liability in auto accident claims, and has led to overuse of expensive medical treatments. This in turn has led to high insurance premiums. In order to address the reluctance of insurance companies to insure against unlimited losses, the legislature created the Michigan Catastrophic Claims Association. This then led to assessments that have been inefficient, volatile, and have reached levels that are in excess of $100 per vehicle. In response to the high insurance premiums that resulted from this, the legislature restricted the use by insurance companies of variables that are correlated with certain socioeconomic characteristics, such as income and location. This, in turn, increased the cost of providing insurance for the majority of drivers. This led to political pressure to limit premiums and further government interference in the market, with additional unintended consequences, as Mises discussed. Thankfully, that cycle can be reversed. There are some things Michigan lawmakers can do. First, Michigan legislators should replace the unlimited personal injury protection purchase requirement with a system that is more aligned with that in other states. Second, insurance companies should be free to use the risk-management and underwriting tools they deem most fit to determine the probability and costs of accidents. Finally, the Michigan Catastrophic Claims Association should be wound down as reinsurance becomes more affordable for insurers. Combined, these measures would reduce the pressure on premiums and the attendant political pressure to attempt to centrally plan the auto insurance industry in Michigan. The biggest winners would be consumers, who would benefit from lower premiums and greater choice.